I was recently a naturalist with Classic Canadian Tours to the Khutzeymateen Grizzly Bear Sanctuary on the North coast of B.C. The park is the largest remaining intact coastal temperate rainforest in the world, can only be accessed by boat or float plane and was specifically set aside to protect grizzly bears and their habitat. About 50 grizzly bears call this park home, which is the about the same number that live in all of Banff National Park. That may not sound impressive at first, but the Khutzeymateen is 16 times smaller in area than Banff! As such it has one of the highest concentrations of grizzly bears in North America and if you time it just right the bears are on almost every beach that you come across. They come down to the huge estuary almost everyday at low tide from late-spring to mid-summer to feast on crabs, clams, sedgegrass and whatever else they stumble upon. In the 2 hours we were in the park we came across 7 grizzly including a mom and cub that play fought along the shore as we watched from the boat! On the way to and from the park we also saw breaching humpback whales that had just started to return from the north to feed on the abundant herring, lounging harbor seals, stellar sea lions, bald eagles fishing for the salmon and countless other coastal bird life. It was an incredible day of wildlife viewing! To give you an idea of the habitat I chose this photo of the rainforest and one of the many rivers feeding into the estuary. 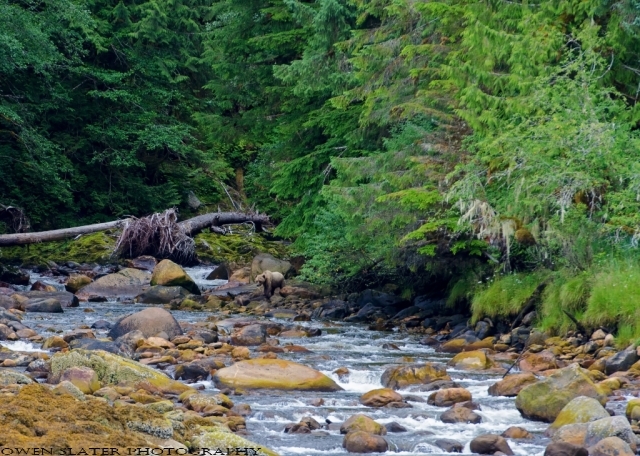 A grizzly bear appeared at the edge of the river and seemed to be checking it out for any returning salmon. In a few weeks the bears will be farther inland feasting on all the spawning, dead and decaying salmon trying to put on as much fat as possible for their long winter sleep. A truly very unique place. If you are interested in seeing the Khutzeymateen but can’t afford to be away for very long or the expense of a multi-day trip, Classic Canadian Tours has day tours from both Calgary and Edmonton that are sure to sell out again in 2014. Dates will be announced soon so stay tuned!